This is Brendan's third studio album and is a collection of songs written in and inspired by his adoptive home of New York City. It is full of lush harmonies and gorgeous crescendos, Brendan’s unmistakable voice is surely the star of this record. 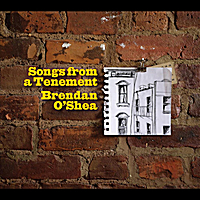 With his first release in nearly four years, Songs From A Tenement marks the return of beloved singer-songwriter Brendan O’Shea. Now a staple in the East Village Indie-folk scene, Irish native Brendan O’Shea first garnered attention with the release of his debut album in 2003. Now, two albums, seven years, and many accolades later, he is proud to present a collection of songs written in and inspired by his adoptive home of New York City. Most recently, Brendan embarked on a month long tour of Japan as a special guest of the Trinity Dance Company. His music was also heavily featured on the hit ABC docu-drama Boston Med. Brendan is currently available for interviews and appearances. All inquiries should go through info@brendanoshea.com. A little less . . .
Brendan O'Shea is one of my favorites and his previous albums are among my most listened to. This album is rather a departure from his earlier, and rather better work, IMHO. I thought Brendan had established a very recognizable sound in his other releases - sensitive, bare, intimate - but that is by the wayside here, in part due to the much fuller band and to the overwhelmingly saccharine harmonizing that drains all the character from his vocal efforts. I wish Brendan had released this as a solo acoustic set without the background vocals and extraneous instruments (especially the organ). As a huge fan of Brendan O'Shea I'm a bit saddened by the direction this album has taken though YMMV. A few standout tracks towards the end but the first half was not my cup of tea. This is one of my favorite albums so far this year 2010. It is full of sweet music with wonderful harmonies. It's an album of hope, love and excitement for the future, just what we all need. It would also make a great Christmas/Holiday present for any of the members of your family.